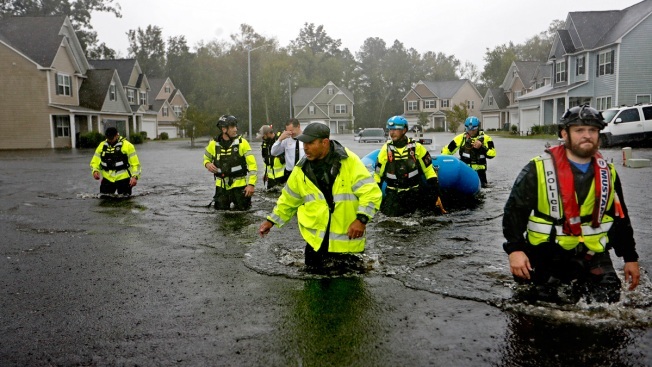 Members of the North Carolina Task Force urban search and rescue team wade through a flooded neighborhood looking for residents who stayed behind as Florence continues to dump heavy rain in Fayetteville, N.C., Sunday, Sept. 16, 2018. More than six months after Hurricane Irma's catastrophic rampage across the Caribbean and the southeastern United States, the number of deaths attributed to the storm increased to 129 — more than twice the amount reported at the end of the storm. It took years for Hurricane Katrina's death toll to become fully known. That number is still debated today with figures used by disaster agencies varying by as much as 600 deaths. And while the change in the number of dead from Hurricane Maria is perhaps the most dramatic — rising from 64 to a 2,975 after the Puerto Rican governor commissioned university researchers to review the count — it's common for death tolls in natural disasters to escalate weeks and months later because of deaths indirectly caused by a storm. 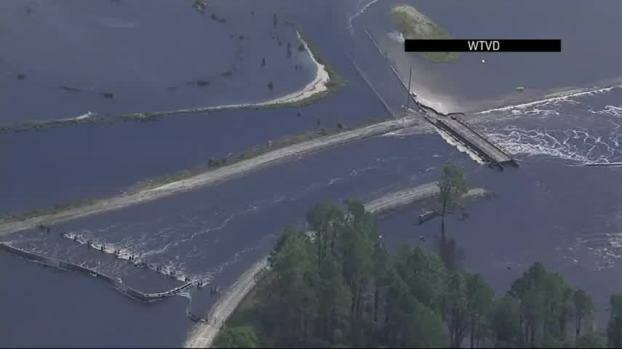 Those can include things like infections from contaminated water, electrocutions from downed power lines and failure to receive dialysis because of power outages. Deaths directly linked to a disaster include drownings from a storm surge or being crushed in a wind-toppled building. 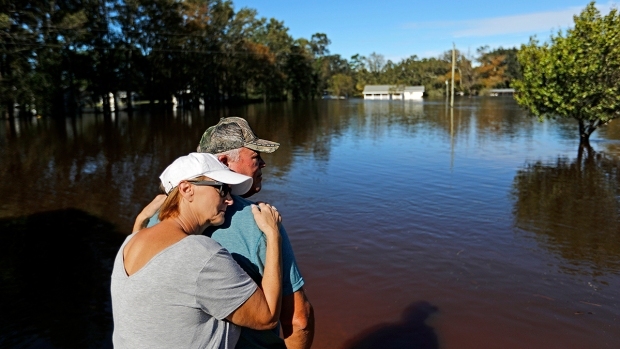 "Sometimes we may never know how many deaths really occurred," said Susan L. Cutter, director of Hazards & Vulnerability Research Institute at University of South Carolina. 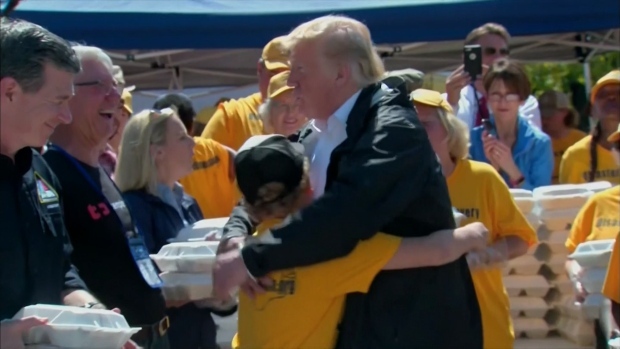 On Friday, President Donald Trump falsely accused Democrats of inflating the death toll from Hurricane Maria to make him "look as bad as possible." He said 18 people had been reported dead when he visited the island on Oct. 3, two weeks after the storm hit, though the U.S. territory's official death toll was raised to 34 later that day. After that, it climbed to 64. "FIFTY TIMES LAST ORIGINAL NUMBER - NO WAY!" he tweeted late Friday. Unlike tornados that destroy a relatively small area, hurricanes pose challenges in getting a count quickly because of the vast regions that the storms affect, according to disaster experts. Flooding can mean places are under water for weeks, hiding the dead. Some people may be swept miles away from their homes. People may not be reported missing because friends and neighbors believe they evacuated and decided not to return. The poor, disabled and elderly are at most risk after a storm hits because they often don't have the means to get out and are unable to get to food, water and medicines. Those are the deaths that commonly are added later. The poorer the community, the tougher it is to get an accurate account because people are overwhelmed with dealing with the immediate crisis and don't have the resources to document the dead. Death tolls in some developing countries vary by the tens of thousands because typically it's not known how many people were actually ever living in affected areas. Trump suggested that in Puerto Rico, many deaths had been added later "if a person died for any reason, like old age." There are discrepancies in how the deaths are recorded but disaster experts say that often causes an undercount. If a drowning on a death certificate does not link it to a storm, it may not be counted. Puerto Rico's initial count of 64 included only people whose death certificates cited the storm. Outrage from thousands of families who said they had lost loved ones due to post-storm conditions pushed the territory to hire George Washington University to study how many more deaths than usual has occurred after the storm. The university said it was an estimated 2,975 deaths, a figure that has been roughly corroborated by other, similar studies. No single government entity is tasked with counting the dead in a natural disaster. Officials rely on everything from media accounts to first responders' reports. Long before Trump raised the question, there was debate over which deaths to attribute to a disaster. The direct death toll from Irma stands at 47 across the Caribbean and Southern U.S., according to the National Hurricane Center. An additional 82 deaths — 77 of them in Florida — were indirectly caused by the storm. The deaths included 14 people who died at a Florida nursing home that lost power and air conditioning. Other deaths were caused by falls during storm preparations, vehicle accidents, carbon monoxide poisoning from generators, chain saw accidents and electrocutions. It also took years to assess the death toll from Hurricane Katrina in 2005 despite the relative accessibility of the Gulf Coast. About 1,800 died from Katrina, though some agencies still list it at 1,200. The lesson is that realistic death tolls from storms take a while, said Princeton University hurricane scientist Gabriel Vecchi, who said when he heard about a death toll of only six from Hurricane Maria a year ago, he and his colleagues "knew that it couldn't be right." "You need to be careful on placing too much stake on preliminary numbers," Vecchi said Saturday. "This is a disaster area. We don't have a full sense of what goes on until a considerable period later for many obvious reasons."